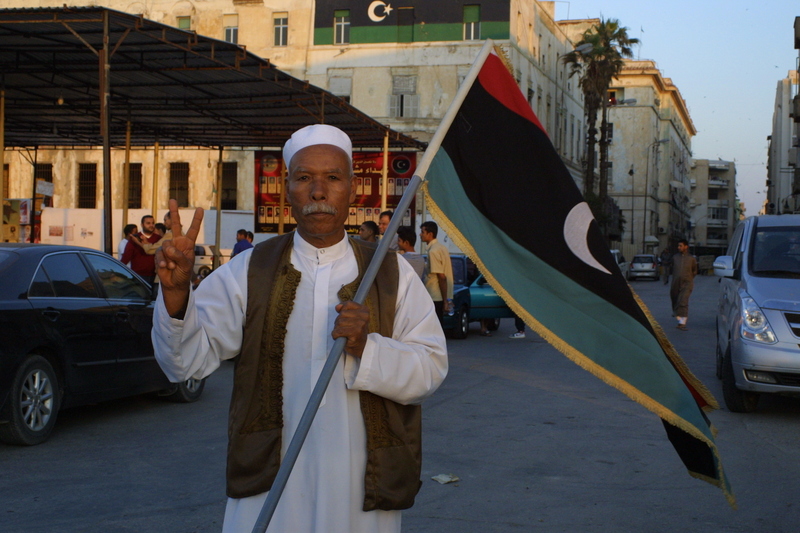 Man demonstrates against militia power, carrying a Libyan flag. Dressed in military fatigues and carrying AK-47 assault rifles, the Zintan militia surrounded the building in Tripoli and entered without a fight. They weren’t seizing the last remaining Qaddafi stronghold; they were taking an oil company CEO hostage. The militiamen were demanding money for protecting the CEO’s oil fields during Libya’s civil war. There was only one problem. The company had already paid $600,000 for those services and wasn’t about to pay again. A month earlier, a different armed group seized the offices of the same company demanding protection money. Employees didn’t know which militia carried out that raid. Forty-five miles away from the foreign oil company offices, the Zawiya refinery was producing gasoline and other fuels at 102 percent of capacity. Because each faction during the civil war figured it would be the eventual winner, much of the country’s oil infrastructure has remained intact. Overall oil production hit 1.5 million barrels per day in May, close to the 1.77 million mark under Qaddafi. British Petroleum announced it will resume exploration. France, Italy, Spain, Great Britain, and the United States are getting their crude, while near chaos reigns in the rest of the country. The Western-backed National Transition Council (NTC) operates a weak and ineffective government. Some sixty militias are the real power centers. Unable to suppress the militias, the council uses some as auxiliary forces to be called out in time of emergency. Others are signing up among the various political parties, a dangerous trend. I asked a State Department spokesman in Washington about the invasion’s political aftermath. He minimized the problems, arguing that the American colonists who expelled the British also fought among themselves after the Revolutionary War. “In 1787, there was major conflict between the groups that fought,” he told me. But Libya’s situation is far more unstable. I don’t believe there are any recorded cases of disgruntled American revolutionaries engaging in cannon and musket battles in front of the American government headquarters with George Washington trapped inside. That’s the equivalent of what happened in May when one militia used anti-aircraft cannons and rocket-propelled grenades to fight a two-hour gun battle outside the prime minister’s office in Tripoli. Granted, any post-Qaddafi government in Libya was bound to face serious problems. The former dictator had suppressed independent political parties, trade unions, and the media. Libyans are building civil society institutions from the ground up. But the NATO invasion made conditions much worse because the United States allied with militias and politicians most likely to ensure Western dominance, not those most determined to build democratic institutions. Washington sought allies among the ex-Qaddafi military leadership and the newly minted militia leaders. The Obama Administration first backed Major General Khalifa Haftar, who reportedly had CIA ties while living in the United States for many years. He became commander-in-chief of the National Army until he was ambushed and wounded by the Zintan militia. Shortly thereafter he was demoted. The United States also backs Osama Al-Juwali, current minister of defense and former leader of the Zintan militia. Libyan revolutionaries fear that such men will become U.S.-backed autocrats, similar to those who rose in Afghanistan. The United States and the International Monetary Fund also are imposing cookie-cutter solutions for Libya’s economic future, leaning on the council to privatize state-owned companies and eliminate state subsidies. The IMF will also face strong opposition from Libya’s nascent trade union movement, which has organized dozens of strikes so far this year. Workers at the Sirte Oil Company struck last October and forced the removal of the company president. Libya’s future economic policies are supposed to be determined through free elections for a national assembly, which will appoint a new government and oversee writing a new constitution. The elections will take place July 7. But as experience in Afghanistan and Iraq shows, one or two elections do not a democracy make. In a particularly dangerous development, political parties are now allying with the strongest of the militias. The Muslim Brotherhood’s Justice and Development Party has a militia. Jihadist leader Abd al-Hakim Belhadj ran for the assembly while maintaining his Tripoli militia. The alliances of parties and militias can quickly develop into a system of warlords, with politicians illegally siphoning off government funds to pay for the salaries and arms of their allied forces. Libya seems destined for a prolonged period of instability. Despite these clouds, Alamin remains upbeat. “I’m optimistic,” he says. Just because the United States has a plan to rule Libya doesn’t mean it will actually happen, he contends. The popular revolution that overthrew Qaddafi will not accept another strongman—at least not without a fight.